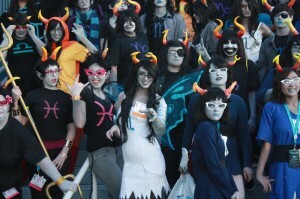 High-blooded Trolls, from the Anime Expo 2012 Homestuck meet up. My SF-writing dreams are as traditional as they can get. I want to make a living by selling my fiction to publishers. I long to see my name nestled with other SF-award nominees, on the cover of Asimov’s, on the New York Times Bestseller list, and on the shelf of the local bookstore. The path seems clear: Create solid short stories and submit them to pro markets. Write novels and pitch them to agents until someone picks you up. Network with others in the industry, and get involved in the community. Improve your craft through writers groups and workshops. The pro venues are shifting: more stories are being published in online pubs or other digital formats, but most folks I know are still writing and submitting and networking with traditional gatekeepers in mind: publishers, editors, slush-readers, and agents. I wonder sometimes if I’m going for the right gates, or if I should turn from those entrances altogether. Last week, I went to Anime Expo in Los Angeles, and my experience there has me reevaluating my aspirations as a storyteller. Many attendees were in costume, dressed as characters from popular manga, video game, and animation series in the US and Japan, like Final Fantasy, Pokemon, and Avatar: The Last Airbender. This industry has its own gatekeepers. 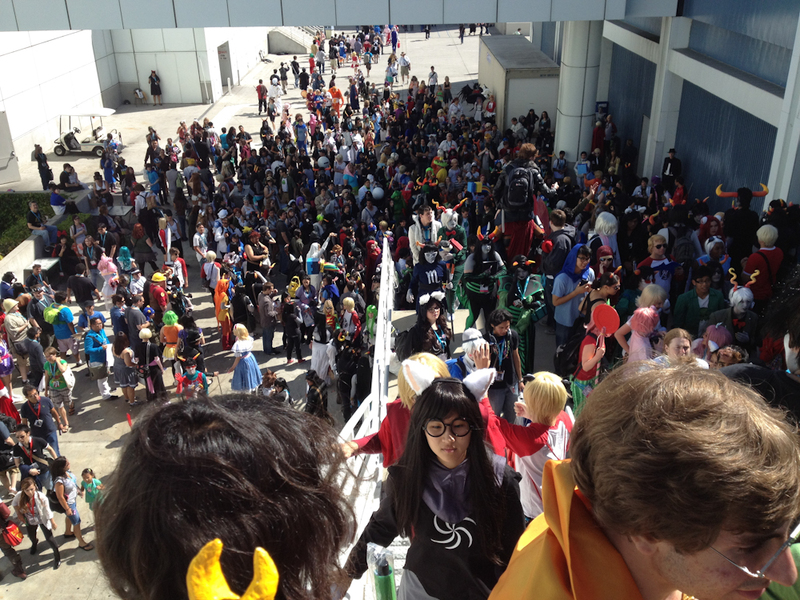 But they were all vastly outnumbered by the teens in Homestuck costumes. I’m going to go out on a limb and say that most of you are largely unaware of Homestuck. I only know about it because my 15-year-old daughter is obsessed with it. But at Anime Expo, there were so many Homestuck cosplayers that the photo op meet up had to be moved several times to find a place large enough to hold everyone. There were so many cosplayers on one wide stairway that Expo staff became concerned with structural integrity and crowd control. 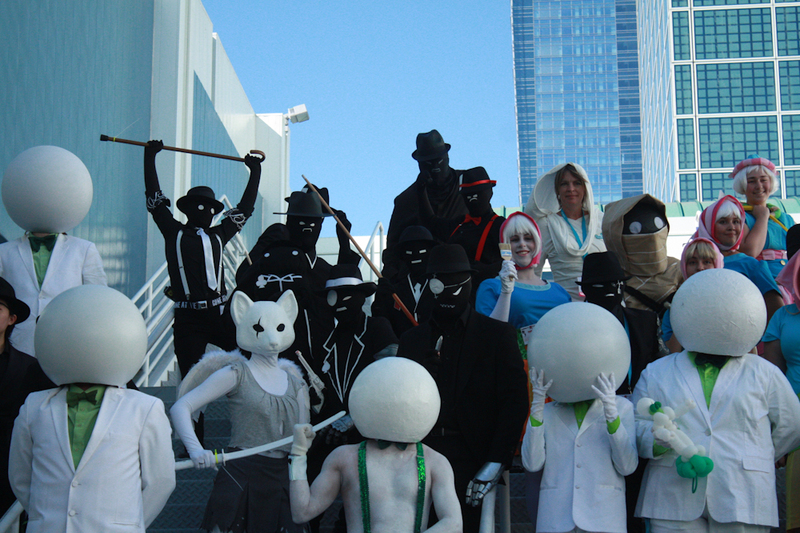 There were easily over a thousand in costume, and both onlookers and die-hard fans were blown away by the turn out. Homestuck is a quirky, surreal, specific webcomic that subverts and plays with storytelling modes, including chat logs, webcomics, video games, flash and animated gifs. From interviews, it’s obvious that storytelling is hugely important to creator Andrew Hussie, and Homestuck is remarkably effective at reaching an audience. It gets 600,000 unique views per day and generates enough income to support its creator. It’s hard to imagine a traditional gatekeeper taking a risk on Andrew Hussie. Are there other ways to more effectively reach an audience for our stories? Do we constrain our storytelling creativity by trying to fit them into the traditional short story and novel frameworks? We’re in a transitional world right now. If you’re in any kind of artistic field, the nature of distribution is changing. The models by which creators got their work out into the world and got to keep a roof over their heads and bought sandwiches while they did that. They’re all changing. I’ve talked to people at the top of the food chain in publishing and book selling and music and all those areas and no one knows what the landscape will look like two years from now. Let alone a decade away. The distribution channels that people have built over the last century or so are in flux. For print, for visual artists, for musicians, for creative people of all kinds. Which is on the one hand intimidating and on the other, immensely liberating. The rules, the assumptions, the now-we’re-supposed-to’s of how you get your work seen and what you do then, they’re breaking down. The gatekeepers are leaving their gates. You can be as creative as you need to be to get your work seen. YouTube and the web, and whatever comes after YouTube and the web, can give you more people watching than all television ever did. The old rules are crumbling and nobody knows what the new rules are. So make up your own rules. The answers are not black and white, unfortunately. It’s really interesting to see subcultures and their different views on this idea. Webcomics had their struggle against the traditional comic world a long time ago, and they’re not a market to be sneezed at these days. The world where I’m from, the tabletop RPG market, doesn’t have a huge tradition of publishers looking for your game manuscript — so if you want to get your game out there, you have to strike out on your own. So the idea of gatekeepers for me ends up being far different as well. Ryan, it sounds like there are things SF writers can learn from RPG writers. To be fair, I do see some innovation, as writers experiment with kickstarter funding, self-promotion, releasing works under creative commons licenses, even collaboration with musicians. Neil Gaiman only achieved mainstream success after working damn hard at his craft in graphic novels. I’m not sure he’s the best example since his road to best-seller-dom wasn’t write book, query, sign with agent, sell to publisher, $$. I think artists of all kinds today need to diversify and examine how best to exploit their unique talents and skills. The traditional routes aren’t for everyone and shouldn’t be seen as the only path to success.